Everything was passed and published into law today. For the key points on what the investor visa has to offer see our property visa website dedicated to investor visa properties satisfying the qualifying limit. Please note these are key points and meant as a guide. Every individual should seek proper legal advice applicable to their own personal circumstances. La Vida Spain and our affiliated lawyers can provide this for anybody wishing to use our property finder service. Just to clarify, many potential investors have asked about the visa investor limit for the Spanish immigration visa. It is 500,000 Euros and not 160,000 Euros as was originally suggested by the Spanish government in November 2012. The law has now been passed through parliament so it is only property purchases of 500,000 Euros and above that will qualify. There are several old news stories on the web that mention the initial proposal for the limit. The investor visa law has today been published in the official bulletin. So everything is now approved it just requires royal signature and will be entered into law hopefully in the coming days. That means you can then apply for the visa if you have bought a property. It will be retrospective so anybody who has bought recently can then apply. Anybody considering buying in Spain to take advantage of this should look seriously now for best choice. It takes 1-2 months to complete a purchase and 10-20 days for the visa after that. We have received many enquiries for properties over the €500,000 limit and also for investment portfolios of several apartments under the €500,000 limit. The new residency visa legislation was approved by the Spanish Senate yesterday without change to the draft proposal. Known as “Apoyo a los emprendedores y su internacionalización” it will come into effect on the day of its official publication in the state bulletin. Expected in a few weeks. Investors interested in obtaining a Spanish residency visa through the purchase of a property please contact us. 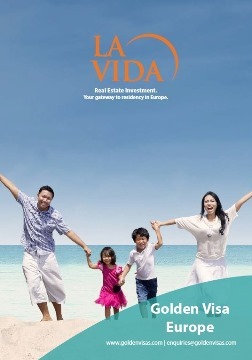 Please note we can only advise investors who are buying through our real estate agency La Vida Spain. You can visit our selection of qualifying real estate at our Spanish visa property website. The draft investor visa legislation is set for debate in the Spanish parliament next week. The main points of the draft have already been published and discussed on this website and lawyers don’t expect too many changes to the draft. The government in Spain is keen to push this residency legislation through. That’s why they have a 20 day limit for response to any application – otherwise the visa is automatically issued. Once passed we expect high demand, particularly from countries such as Russia, China and India. Likewise countries throughout the Middle East. I read recently that over 1000 Chinese buyers have invested in Cyprus in the last year to obtain the investor visa! Considering Cyprus is 1500 miles from the centre of Europe but only 100 miles from Syria and unlike Spain is not part of the EU Schengen visa zone that’s quite an achievement. Especially as conditions for the residency visa in Cyprus include investing €30,000 per family member into a bank account in Cyprus in addition to a property purchase. Followers of the Cypriot banking crisis may agree that’s not for the faint hearted! Still, it demonstrates the incredible demand for investor visas in Europe and bodes well for demand for the Spanish “golden visa”.